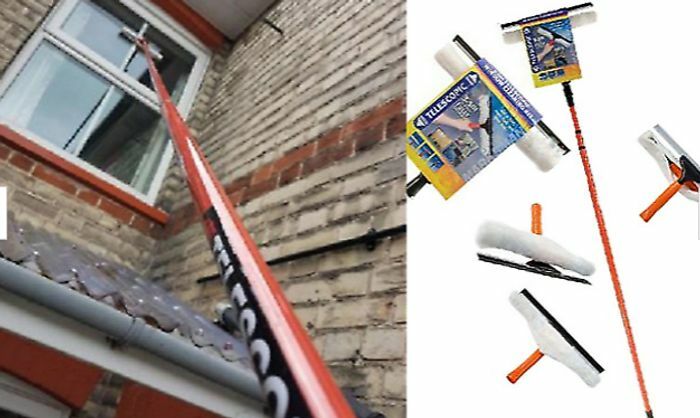 Save on your window cleaning bill and do it yourself with this great deal on a 11ft telescopic kit. No need for ladders - you can easily clean upper windows and conservatory roofs! What do you think of this Google.co.uk deal? The pole system our window cleaner uses DOESN'T clean them right,we have a fan set in our bathroom window,he can't get round it so we have to do it.. Always use a traditional window cleaner. These new people with the pole systems haven't got a clue and use way to much water anyway. He used to do our windows the traditional way when he was a partner,now he works alone so I suppose it's quicker for him but rubbish for us..